With the rise of smartphones that have proficient camera systems, the relevance of most standalone imaging devices, including the action cameras, seems to have come under question. From wide-angle lenses to sensors equipped with optical image stabilisation, mobile cameras of today are fit to give many an action camera a run for its money. However, the Hero 7 Black seems to hold its own. Coming from the stable of GoPro, the American technology company that created the action camera genre, has features that beat smartphone cameras on their own turf. Like the Hero 6, the Hero 7 Black also has a rectangular design with a wide-angle camera lens, monochrome display and LED indicator on the front, besides a touchscreen with secondary LED indicator on the back. The camera shares its chassis and design elements with the Hero 6, making it compatible with the predecessor’s accessories, such as mounts, tripod, Karma Grip, etc. What sets the Hero 7 Black apart from the Hero 6 is that the newer camera is loaded with features — for one, it has a stabilisation system claimed to match gimbal-like output. The camera actually lives up to the expectations and records a smooth video with no visible shakes. Named HyperSmooth, the stabilisation is software-based (EIS), and not hardware-backed (OIS), so it trims some of the frame-of-view (FoV) from all sides. Interestingly, video stabilisation is not limited to recording videos in a regular mode; it also shows its capabilities in the TimeWarp mode. Exclusive to the Hero 7 Black, this mode is available along with the timelapse (Hyperlapse) mode. However, unlike the timelapse, where the fast-forward video is recorded with a camera fixed at one place, the TimeWarp allows you to take the camera along and record shake-free fast forward videos — they come out perfect and open another experimentation area for adventure sports enthusiasts. If HyperSmooth and TimeWarp were not enough, the Hero 7 Black also allows you to live stream videos on Facebook and YouTube through the real-time messaging protocol (RTMP). However, this feature requires the camera to be connected with a smartphone (Android or iOS). You need to connect the camera with a phone and set up the Facebook account or RTMP settings in the GoPro app to share the live stream from this camera. The Hero 7 Black is the only GoPro action camera with this feature, and it works well, provided the connections between your phone and camera, and camera and internet services, work seamlessly. 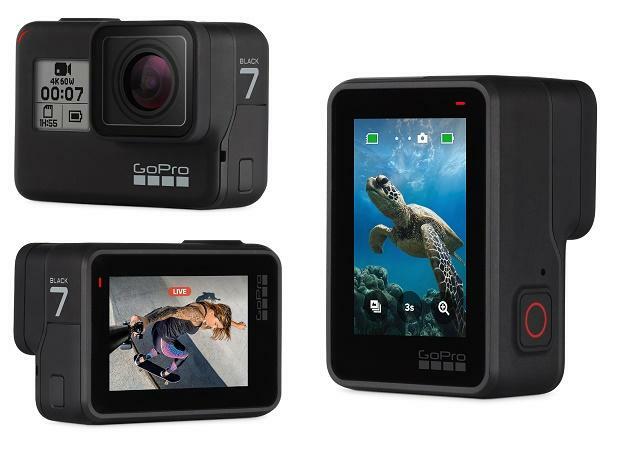 The GoPro Hero 7 Black also supports vertical video recording which makes it ideal for social media enthusiasts — vertical videos work better on social media than those recorded in the conventional 16:9 aspect ratio. The action camera also responds to voice commands. Say “GoPro, turn on” aloud to switch it on, and “GoPro, start/stop recording” to begin or stop recording. Thankfully, the Hero 7 Black supports Indian accent (Indian English, that is). Although the camera recognises voice commands easily in silent environments, it shows some difficulty (or completely fails) in loud and noisy places. Overall, there is nothing to not like about the GoPro Hero 7 Black, except its hefty price tag of Rs 37,000. This product covers almost everything that you expect from a full-fledged action camera.